"Approved Code No. 363--Amendment No. 1." .. i; ..... .. :.. .
ii] :: Z:i:. .... ... .. .
..i: i : ... .. .........," ". .:.;.. .... .. .. ... :." ... .. .... ... ..
........ ... ... ,. . This publication s for saleby he i det o Dof G..
Charleston, B.C. : Chamber of Commerce Building. Detroit, Mich.: 801 Frst National Bank Building. Indianspolis, Ind. : Chamber of Commerce Building. Minneapolis, Minn.: 21a Federal Building. New Orleans La. : Room 225-A, Customhouse. San Frapcisco, Calif.: 310 Customhouse. Seattle, WaIs. : 809 Federal Office Building. ..:. *. ':.'-:. :' .. .
Fair Competition for the Mens NK earwr, Industry was conducted on::. Thursday, May 10th in Boom'109 of the Raleigh iHotel" Washington, "
dustry who had requested opportunity to be heard on the proposed ? the usual requirements of the National Recovery Administration. of other Codes in the Apparel Trades have required. :. 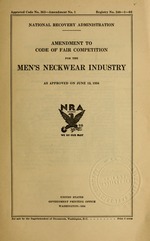 The Code Authority for the Men's Neckwear Industry onr A"
14th recommended to the Administrator that the Men's Neckwhe. rules and regulations and appropriate machinery for the issuance i:! practices of employers using such labels. ducts of the Industry. The charge made by the Code Authorty' "
to the attention of the Code Authority; the use of the label also.i. practice provisions of the Code. iaci (b) of Section 10 thereof. nendments, on behalf of the Industry as a whole. Wig: not permit monopolies or monopolistic practices. reasons, this amendment has been approved. said labels to the members of the Industry. mit shall be granted only when the application for use thereof aal i! be accompanied by a certificate of compliance with this Code sige ii. date of this Article, may have securely attached to the box, cover, :! 4. The charge made by the Code Authority for labels shall at all. cost of distribution to members of the Industry. Approved Code No. 363-Amendment No. 1. I ,". .' : .Z ... ." .. .
lE 'S ';::.i^ '.":., . '2. < .. ..-u :41! .4 ..
-,9i---i. ...'!. .... i. .